Red’s & Trudy’s, located on 501 Portville-Ceres Road, in Portville, New York, has been a “mainstay” in Portville since the 1920’s. There is a half-dozen booths inside, along with stools and a diner-style counter. 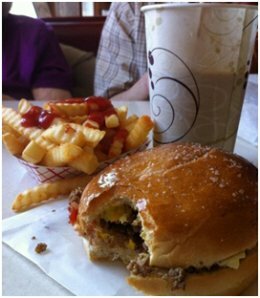 Famous for their loose hamburger on a nicely toasted, homemade roll, with butter and salt on top. Don’t forget to get their famous milkshakes for desert. This roadside restaurant will be sure to provide you with delicious food, local character, and depression-era prices.